Your dog’s leash is your key training tool, so get your pooch used to being on a leash as quickly as possible. 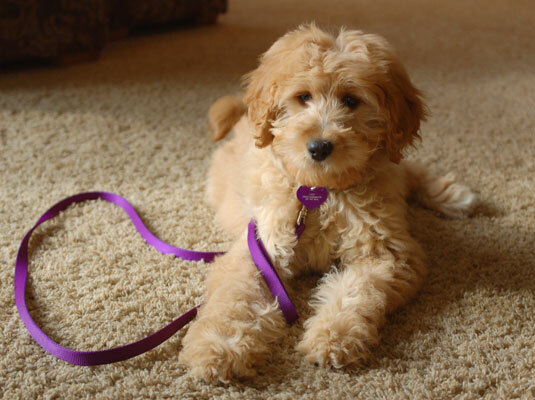 Most dogs have no trouble accepting the leash, although puppies may need a little time to adjust. Attach the leash to the dead ring (the stationary ring on a training collar) of your dog’s collar. Let your dog drag the leash around. Supervise so that she doesn’t get tangled up. Repeat Steps 1 and 2 over a period of a few days. When your puppy is so used to the leash that she ignores it, pick up the other end and follow her around. Just let her wander wherever her fancy takes her — within reason, of course. Use a treat to entice your puppy to follow you. If you’re outside, use the treat to coax her away from the house. Puppies are sometimes reluctant to go away from the house, even for a treat. In that case, pick up your puppy, carry her away from the house, put her down, and she’ll lead you back to the house. Guide your dog gently with the leash, telling her what a good puppy she is. If you’re outside, use the leash to guide your trainee back toward the house. Before you know it, your pup will not only walk on the leash in your direction but also actually pull you along!